Hey ya’ll! Here we GO!! Season 19 of Survivor is now in play! The scenery is just breathtaking. 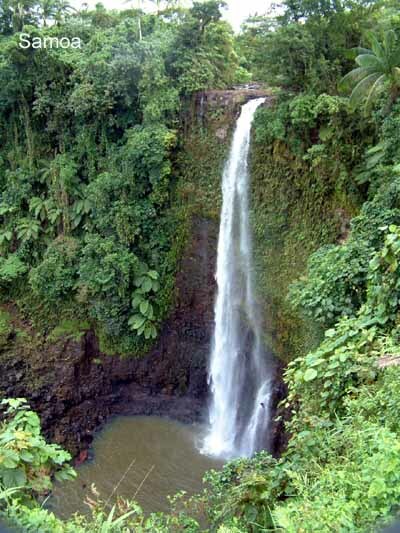 I was stunned by the beauty of the place, with the waterfalls, crashing waves causing geyers, the verdant jungle. Wow.. One of the more beautiful places Survivor has ever filmed. Now.. on to the people and the show last night. What an interesting twist that this year. Instead of instantly nominating someone to go home, without ever speaking to each other, they nominated a “leader” for each tribe simply based on looks. Now, remember, even though these castaways have not spoken to each other, they HAVE been staying for several days together at the Ponderosa. That means that they have at least been able to observe each others mannerisms and body language. So, we know that just from those observations, the others have KIND of an idea of what the others MIGHT be made of. OK.. The tribes, First.. Galu, the purple tribe. This tribe picked Russell the attorney to be their leader, he obviously was not thrilled with the idea, but he rose to the challenge and picked decent participants in the first challenge. This tribe obviously, did not get the bulk of the attention last night, since the did not go to Tribal Counsel, and the only standout to me, was Shambo. She made herself quite conspicious by vocalizing the fact that she was tired of John (the rocket scientist) PLANNING the camp, and go ahead and BUILD the darn thing already. That does not bode well for Shambo. That and the fact that she was the only one who did not going in the group swim-meet, have to have garnered some attention. The Foa-Foa Tribe.. I KNEW IT!! I KNEW my Mick was going to shine! (YES, my Marisa pick almost negates that, but hey.. I told you I was going to eat crow on those predictions) One thing about Marisa is that she SAW Russell.. Also, my girl Betsy is seeing him too.. She is just smart enough to keep it a little quieter for now. Mick.. who I still think is going to be the “Jeff” of this tribe, did a phenomenal job of picking his selections for the comp. Even though there were some eyebrows raised when he picked Jaison, an African American to do the swim challenges. Jaison, however, ROCKED that comp, giving Foa Foa the lead they needed to win the first competition. Russell.. Russell.. Russell…. Well, I gotta say that Hubby really LIKES this guy.. (we may get divorced..jk-LOL) Actually, he IS a little refreshing, at least so far. I can see how it could be wearing on us if he keeps up the diabolicalicity (is that a word?? Well, it should be for this guy). BUT, unlike previous villains we have all seen on this show, this guys is GLEEFULLY embracing his evilness.. I am rooting for our cop, Betsy, to start a full on investigation, including stake outs, sting ops, etc.. To get this guy! That should be some fine entertainment! So… Who are your early faves?? Three of mine are still hanging in there.. Mick.. Jaison, and Betsy.. And all on the same tribe.. so I say.. GO FOA FOA! !